Don't let bike storage be a problem for you. Get your bike off the floor and out of the way by going up. The ZWR vertical bike rack makes it easy to load and unload your bike while freeing up much needed space in your apartment or garage. The heavy duty mount features an anti-scratch rubber hook to prevent damage to your rim while anti-slip treads help to hold your bike firmly in place. The spring loaded hook can lock at multiple position to work with any wheel size and folds down to a slimmer profile when not in use. Rack comes with hardware necessary to mount to wall studs. Place the mount on the wall where you would like to install. Using a pencil or pen, trace each mounting hole on the wall. If not drilling into a stud, push the wall anchors inside the holes. Line up the bike wall mount with the drilled holes. Using a screwdriver, tighten the screw to secure the mount in the wall or anchors. Operating Instructions:When in use, the weight of the bike should be resting on the anti-scratch rubber hook of the wall mount. To remove the bike, lift up to take the weight of the bike off the hook and move bike clear of the hook before letting your bike down. WARNING: Recommended install on heavy solid wall or into a stud. Panel or thin drywall without studs will NOT support weight properly. Maximum hanging weight of mount is up to 65 lb. 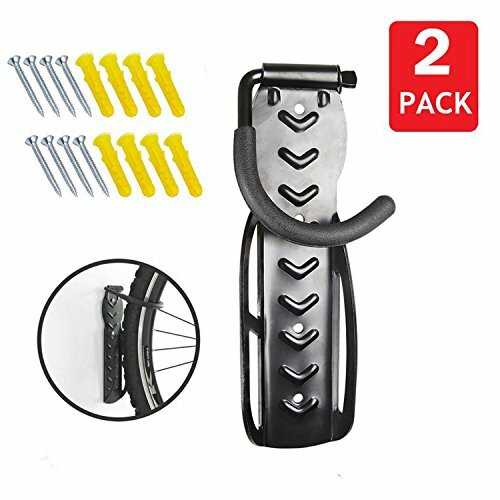 Adjustable: Spring loaded hook can lock at different positions for a variety of tire sizes, and also folds down for a slimmer profile when not holding a bike. If you have any questions about this product by ZWR, contact us by completing and submitting the form below. If you are looking for a specif part number, please include it with your message.